I’ve always been kinda curious about trying enchiladas in a crock pot, so recently, I decided to give it a shot. I chose to make it a vegetarian enchilada recipe, that way, in case things went horribly wrong, I wouldn’t be wasting expensive meat. To my pleasant surprise, these turned out delicious, and I loooooooved having food ready to go in my slow cooker. It’s been pretty hectic in our household lately, so crock pot meals are a savior for me. Each of these incredibly healthy enchiladas comes out to 5 Points each, and that’s including the sour cream topping. Granted, the cheese looked a little weird after being melted in a slow cooker, but the taste was amazing. I will definitely be making these again. Enjoy! An easy, slow cooker Mexican recipe for vegetarian enchiladas that will leave you feeling wonderfully satisfied. 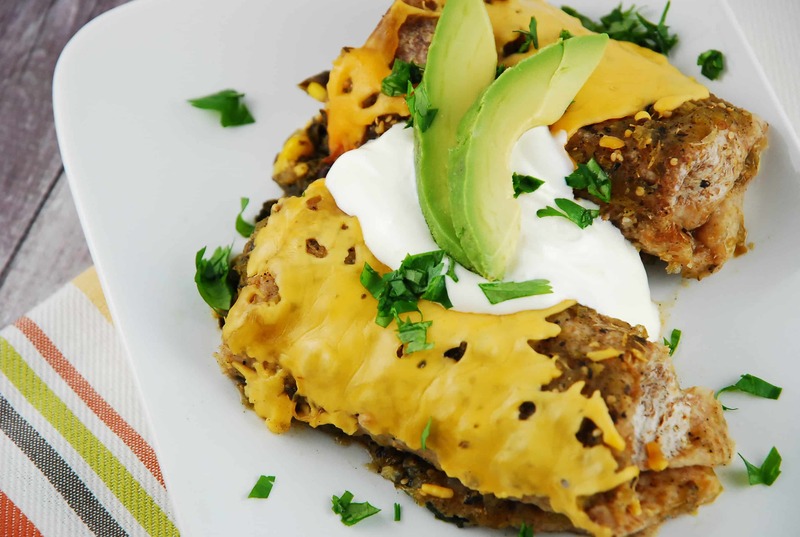 These tasty spinach and black bean enchiladas are loaded with good for you ingredients that will not only be a party for your taste buds, but will also provide you with lots of nourishment. Squeeze as much water from spinach as possible. Then, in a large bowl, mash 1/2 of the black beans with a fork. Add in spinach, corn, remaining black beans, cumin, coriander, chili powder, lime juice and salt & pepper. Mix well. Pour 1 jar of salsa into bottom of the slow cooker. Evenly spoon the bean and spinach mixture onto each tortilla, roll up, and then place seam side down in the slow cooker. Try to lay them all in a single layer, so that they can be easily separated for serving later. Top with remaining jar of salsa and shredded cheese. Cover and cook on low for about 3 hours. Top with sour cream, fresh cilantro, green onions, jalapeños and any other toppings of choice. Yum Yum Yum – my 16 year old twins and husband (and I) all loved these!! I was a little skeptical since they were all veggie only but they were delicious – the only comment from my husband was “how come you didn’t double the recipe?” I cooked about 2.5 hours on low which was plenty hot. We will make again! Just made these for dinner. They were delicious!! The only thing I changed was that I put them in the oven because I didn’t get a chance to get the crockpot going for tonight. 350 degrees for 30 minutes covered and they were perfect. Absolutely a keeper in my house. Made this recipe today. There is no way all 8 enchiladas will fit in the bottom of the crock pot. The ones that were touching the sides of the crock pot burned. I didn’t enjoy the filling either. The only part that I liked was the cheese and salsa. My husband liked the dish but I would choose never to make this dish again. My oval crock is quite large. Guess it depends on the size? Your title says 5 points but at the bottom of the recipe it says 6 points. They sound delicious.